Moray Carshare is a community based car club who provide convenient and affordable transport for its members in a way that minimises the negative effect on the environment. They currently run 16 low-carbon vehicles and one electric bike at eight different locations in and around Findhorn, Kinloss and Forres but are now looking to expand their service into Elgin and Aberlour. The social enterprise has been a success so far, with 180 members currently signed up to to the scheme at the moment who can rent a variety of vehicles 24/7 by the hour, day or week, and pay according to how many miles they drive and how many hours they book. Gordon McAlpine, manager of the charity, hopes to attract more people from Moray’s biggest town to join the service. At last week’s Elgin Community Council meeting he explained: “Our overall mission is to provide community benefit through offering convenient and affordable transport options that minimise the environmental damage and encourage social cohesion. “This new project we have started is a two-year plan that will lead to us establishing a car-sharing service in Elgin with two electric and one hybrid cars plus a charge point for the exclusive use of them. “We also want to establish a car-sharing service in Aberlour with one electric car through a collaboration with Moray Council’s Low Carbon Travel and Transport project. And another part of the project is to provide electric bikes as an option for our members in all these areas. The idea with this is that cycling is good for our health and well being, and that e-bikes offer an easier to use route back in to cycling. 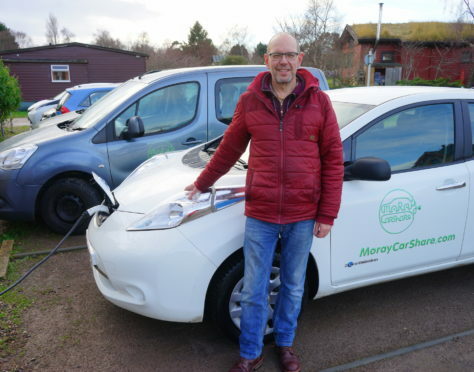 The charity received £137,000 from Moray LEADER and £15,000 from HiTrans to connect and co-operate with local groups and individuals interested in supporting this initiative, hereunder finding the most suitable locations for the electric cars and bikes. Mr McAlpine highlighted that: “Many different types of people find car clubs a good solution for their transport needs. To find out more about Moray Carshare and how you can get involved, visit: www.moraycarshare.com.